A collection of music selected and classroom-tested to encourage interactions and inspire young imaginations. Perfect for teachers or parents looking to foster young creative spirits, the Alfred Playing with the Classics Songbook is a play-along, 30-song CD with a collection of sheet music from the classical and showtunes genres. 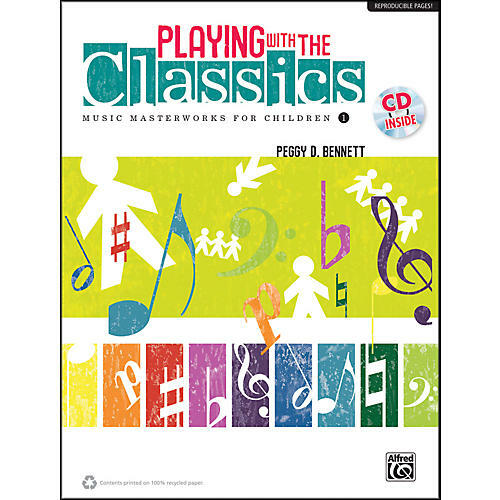 Peggy D. Bennett presents her classroom-tested creative ideas for movement, stories, and listening activities as she delights preschool through primary-age children with orchestral favorites. Fully reproducible and designed to be used by experienced music teachers and novices alike, the simple, charming and playful lessons in Playing With the Classics give children a chance to sing, move, and act while they listen to the music of great composers. Playing With the Classics will help make these great works a part of your students' beloved repertoire of music and capture their interest in orchestral music for a lifetime. Titles include: selections from Gershwin's An American in Paris, Beethoven's Symphony No. 5, Bizet's Carmen, Tchaikovsky's Nutcracker Suite, Haydn's Surprise Symphony, and many more. A perfect collection of classic songs to set your kids on a firm musical foundation. Buy today!